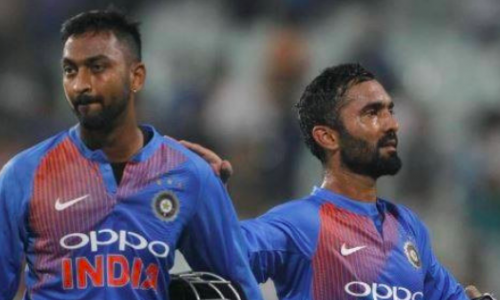 Dinesh Karthik was subject to criticism on social media after he refused a single to Krunal Pandya in the final T20I against New Zealand recently. India fumbled in their chase of 213 runs, struggling at 145-6 at one stage, before Karthik and Krunal joined hands to take the battle to the wire. Needing 16 runs off the final over, Karthik denied Pandya a single, only to eventually fall short by four runs and concede the three-match series 1-2. Fans took to Twitter to show displeasure at the strategy. Why didn’t Karthik take that single? Does he think he is Dhoni?” one user questioned. “Dinesh Karthik is clearly not a fan of Salman Khan. He doesn’t believe in Hit and Run,” another one added. Opening up on the incident, Karthik said: “I think Krunal and I batted really well from that situation. We were able to bring the match down to a place where the bowlers were under pressure. “We backed ourselves to do the job. And at that stage (after refusing the single), I genuinely believed that I could hit a six. “As a middle-order batsman, a lot of times you have to trust your ability to play those big shots under pressure. It is also important to trust your partner at that time.